Payoff Calc is a loan calculator that provides a unique comparison view of your loan balances before and after you apply additional principal payments, enabling you to easily compare the monthly time and cost savings at your fingertips. If you have already made prepayments on your loan, Payoff Calc can show you the adjusted payoff date in addition to the savings and new payoff date for any subsequent extra payments that you make. Fast and easy-to-use, you can use Payoff Calc for different types of fixed-rate loans, including mortgage, auto, credit card, student, etc. 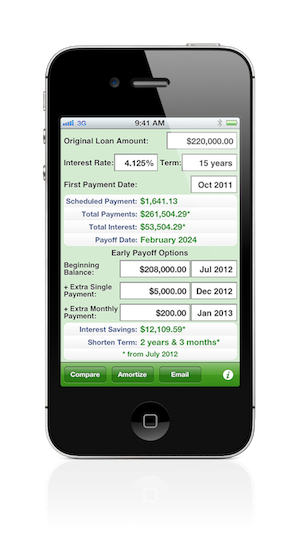 Instantly calculate the monthly payment, total payments, total interest, and payoff date. Simulate what-if scenarios to find out how much you can reduce on both the amount of interest you pay and the length of your loan with one-time and/or recurring additional principal payments. The amortization table details each payment and shows you the date and number of remaining payments so that you know exactly how many payments you have left at any time. You can also email the loan results to yourself or share with others. Beginning Balance: Beginning principal balance at the date you specify. If you do not specify an amount in this field, the Original Loan Amount and the First Payment Date will be used. Compounding Period: Length of time in which interest is computed. + Extra Monthly Payment: Add extra payment amount every month from the date you specify to reduce the principal balance of the loan. + Extra Single Payment: Add one-time extra payment amount at the date you specify to reduce the principal balance of the loan. First Payment Date: First periodic payment due date. Interest Rate: Annual interest rate for the loan. The maximum entry is 99.999%. Interest Savings: Total amount of interest saved by making the extra payments you entered until the loan is paid in full. Original Loan Amount: Amount of principal owed on the loan prior to any repayment. The maximum entry is $99,999,999.99. Payoff Date: Date when the loan balance is paid down to zero, adjusted for any entries you enter in Early Payoff Options. Scheduled Payment: Minimum monthly principal and interest payment based on the terms of the contract. Shorten Term: Length of time reduced by making extra payments you entered until the loan is paid in full. Term: Number of years to repay the loan. Total Interests: Total of all interest paid based on Early Payoff Options: Beginning Balance. Total Payments: Total of all monthly payments based on Early Payoff Options: Beginning Balance. Displays details of each periodic payment until the balance reaches zero. Do I have to enter an amount for Beginning Balance if I have never made any extra payments in the past? No, you can leave the Beginning Balance field empty since Payoff Calc already has the necessary information to calculate your loan. If the Beginning Balance field is empty, the Beginning Balance Date field is ignored. The Beginning Balance field is intended for borrowers to enter a current balance that is different from their original loan schedule. Why is the date that I tried to select in Beginning Balance Date grayed out? You have tried to select a date that is either before the First Payment Date, or after your loan term. Why is the date that I tried to select in Extra Payment Date grayed out? You have tried to select a date that is either before the First Payment Date or Beginning Balance Date, or after your loan term. Why is the amount for my last payment in the amortization table different from my regular scheduled payment? The last payment may be adjusted slightly more or less to bring the balance to zero. Copyright © 2011-2017 Violet Lee. All rights reserved.